Police protection in Lake Bluff began with a single Village Marshal, Franklin Pearce. Pearce was appointed in 1896, shortly after the Village incorporated. His successors as Marshal included Wina Peterson and Barney Rosenhagen. 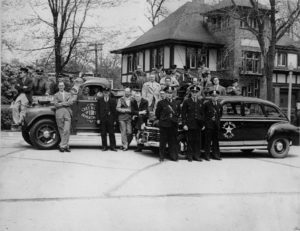 In 1928, Eugene Spaid became Lake Bluff’s first Chief of Police. Christian Elfert joined the force as a patrolman under Chief Spaid in 1943 and was appointed chief in 1946. Elfert hired two patrolmen: Gunner Swalgren and Harlan Kinney. 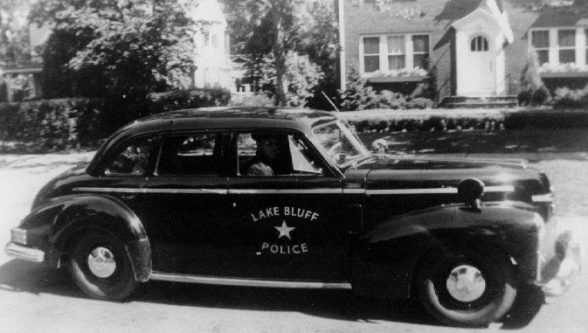 In the early days Lake Bluff’s police officials patrolled the town on a bicycle. 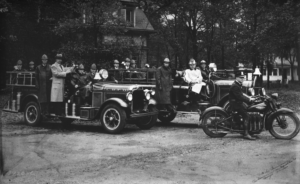 By 1929, Chief Spaid had access to a department motorcycle. 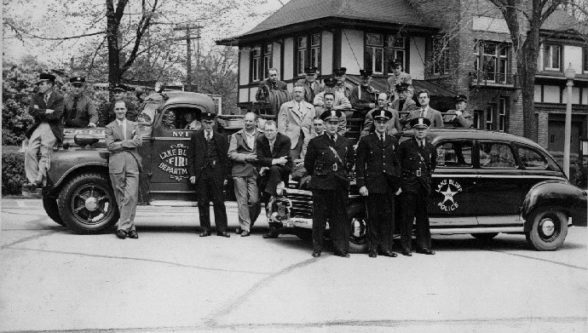 In the 1950s, Chief Elfert’s four-man force boasted a single squad car. Emergency police calls rang in the home of the police chief. Patrolmen in the 1940s, without benefit of radio communication equipment, had to keep an eye on the water tower across from the Village Hall, because a light atop the water tower was their signal to phone in to the desk officer at the Village Hall police station to receive a call assignment. 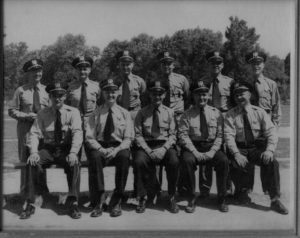 In 1953, to augment his four-man department, which now included Clarence Beckstrom, Chief Elfert established a volunteer police reserve. The first volunteer reservists were Bruce Holmgren, Neale Dickinson, Helmuth Pipenbrok, John Lofstrom, Kenneth Wood, Eugene Androtti and Lawton Crosby. Trained volunteers continued to serve as reservists through the late 1970s. 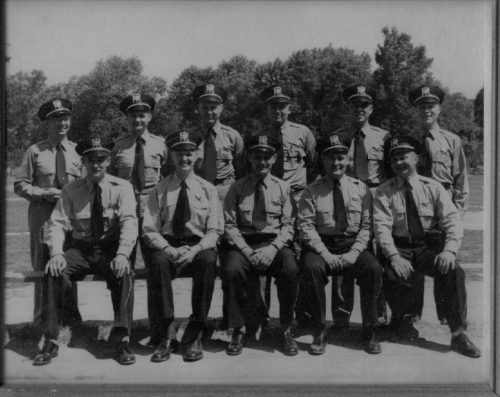 At the time of Chief Elfert’s retirement in 1969, the police force numbered nine. 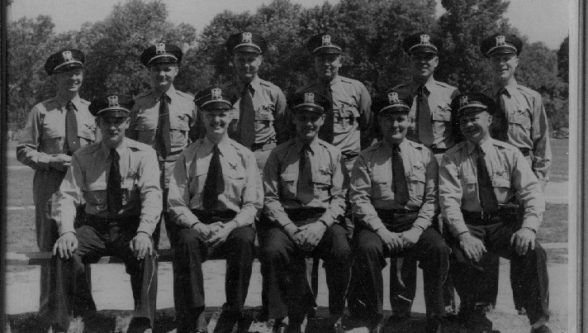 Elfert’s successors as Chief of Police are Myron Hiscox (1968-1977), Fredrick C. Day, Sr. (1977-2001), Acting Chief Carl Schons (2001), William Gallagher (2001-2014) and David Belmonte (2014-present). Prior to 1934, all police and fire operations were located in the Village Hall, built in 1905. When the Public Service Building was constructed in 1934, the Fire Department relocated to that new building. The Police Department continued to operate in the Village Hall until the Public Safety Building was completed in 1988. A small jail cell in the Village Hall, known as the “Calaboose,” was converted into office space in 1973 to accommodate growth in the village administration and police department.